September has just arrived and that means Autumn will soon arrive. Even though in some places we might still be in the dog days of summer, thinking ahead to the cooler and cold months can ensure you’re not scrambling to weatherize at the last minute, and can even save you money as demand for weatherization projects are in lesser demand. Weatherizing is a simple concept. Any home that’s not built to be hyper-efficient (like a passive house) typically has drafts. These often come from under doors, around window frames, and from the attic. Each draft is a space in the barrier between the interior of your house and the great outdoors, where heated air (in the winter) and cooled air (in the summer can escape) – raising the cost of heating and cooling a home. Weatherizing involves sealing up those cracks with caulk, insulation, weather strips, and newer windows, among other things. The idea that weatherizing is not worth the initial cost, or that those initial costs won’t be offset over time, isn’t exactly accurate, even if it’s a common concern. Indeed, weatherization has proven to increase home energy efficiency so significantly that weatherizing programs are common amongst government and community development initiatives. The Department of Energy, for example, has run the Weatherization Assistance Program since 1972, which helps low-income people insulate their homes. The DoE estimates that each of these homes weatherized saves nearly $350 annually, and since 1972 more than 6.2 million homes have been weatherized under the assistance program, saving the United States more than 1.5 million barrels of oil annually. Weatherizing a home can involve any number of home projects, some of which may be major, and some of which may be minor, according to your budget constraints. Sealing cracks with caulk and installing a more energy-efficient thermostat are some examples of small projects; re-insulating your walls and attic (with eco insulation, we hope!) and installing a new furnace or double-paned windows are examples of significantly larger and more expensive projects – although the savings will be even more substantial over time. We’ve even written in the past about some of the less-obvious places to use VOC-free caulking to weatherize your home. These include gaps between construction materials (think between brink and wood, or the foundation and walls); wherever utility lines enter a house; any vent, including dryer and air conditioning vents; and around mail chutes. For the very ambitious weatherizer, there are ways to check for gaps beyond feeling with the hand. Depressurizing the home by turning off all heating and cooling, closing all windows and doors, and then moving an incense stick around common leak gaps can help determine where there are drafts getting in. 1. Insulation: We’ve written extensively in the past about insulating homes and the added benefits of fitting your home so that it retains more heat, instead of losing it. This is better for reducing heating costs, and thus for reducing our environmental footprint – approximately 4 metric tons of carbon dioxide are emitted each year from residences, most of which is the consequence of home heating. Conventional fiberglass insulation is a suspected carcinogen, so using a green product like Bonded Logic Ultratouch Recycled Cotton Insulation is a major step towards making a greener home. For an even more efficient home, National Fiber Cel-Pak Cellulose Insulation is a blow-in material that settles into the tiniest corners and cracks of walls, ceilings, and attics. 2. Caulks and Sealants: Closing up cracks and drafts in homes is an effective – and inexpensive – way to conserve energy and reduce heating and cooling costs. Using VOC-free caulks is an important way to protect the health of everyone in your home. VOCs, or volatile organic compounds, are chemicals that are “off-gassed” from conventional caulks and can cause serious neurological problems, kidney failure, and is a suspected carcinogen. Deforestation is a major environmental issue – but not only in the tropical rainforests of the world. Throughout North America, many forests have been degraded and permanently damaged from clear-cut harvesting techniques. Clear-cutting has a variety of significant negative impacts on local ecosystems wherever it occurs: it leads to the loss of habitat for wildlife species; a loss of jobs and other economic activity once the forest is cleared; a greater possibility of invasive species and other unwanted flora establishing itself on the clearcut site; a decrease in property values; and a decrease in available outdoor recreation opportunities. Clearcutting can also result in massive soil erosion. A study conducted at the University of Oregon found that clear cut areas often suffer three times as much erosion due to slides than areas that were never clear cut; and when logging roads are included in these calculations, slide activity is five times greater relative to nearby forested areas. [Click here for the report]. Moreover, a study from Southern University Carbondale in Illinois found that even after 30 years of recovery of a clear cut oak forest, natural occurrence of native oak trees was dramatically reduced and the presence of other species was greatly increased. Clear cutting didn’t only result in the loss of forest habitat and ecosystem in 1973, when that forest was first harvested – the clear cutting resulted in a permanent (and, arguably, unnatural) alteration to the area’s forest ecosystem. [Click here for the report]. Enter the Healthy Forests, Healthy Communities (HFHC) partnership located in Portland, Oregon. HFHC is an innovative and collaborative project founded by Sustainable Northwest, an NGO dedicated to building partnerships that promote environmentally-sound economic development in Northwest American communities. The HFHC Partnership is a network of people, organizations, and small businesses working together to accomplish a common vision: to build awareness of, and demand for, regionally and responsibly-produced wood products that are created in rural communities. According to their website, the network not only raises that awareness, but “enhances rural capacity to produce and market goods that benefit both entrepreneurs and forest ecosystems.” The idea is that through creating a sustainable wood economy, we can build a rural Northwestern economy that doesn’t rely on the destruction of forest ecosystems to give people a stable livelihood. Sustainable Northwest not only supports the enlargement of this network, but also runs a for-profit subsidiary which promotes and distributes HFHC member products into the marketplace. Sustainable Northwest Wood connects small wood mills to green building markets to help promote not only sustainable forestry, but to promote green building and construction as well. In this manner, HFHC also functions as a marketing service which helps promote healthy forests, and sustainable local economies. 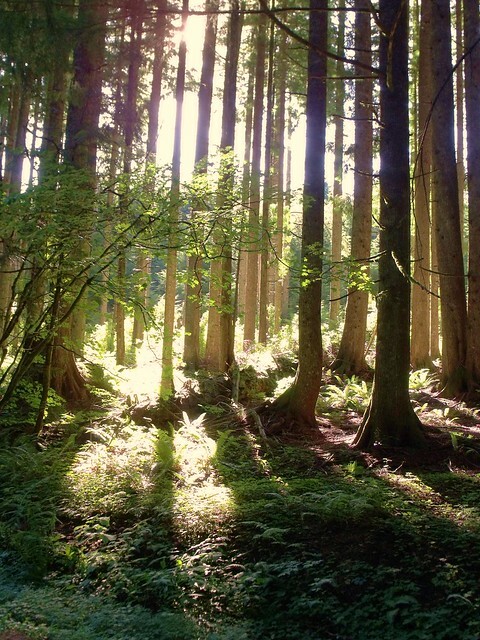 And to back up their claims of sustainability, HFHC relies on the international standard of sustainable forest management: Forest Stewardship Council certification. HFHC maintains a group certificate for FSC Chain of Custody, tracking wood products from the forest to the consumer. According to the HFHC, 25 businesses participate in the group chain of custody. Members of the Health Forests, Healthy Communities partnership have all of their wood products certified under FSC guidelines, and all of the lumber products that we carry at Green Depot are likewise FSC-approved. Lumber products with a Forest Stewardship Council (FSC) seal are sourced from forests that are managed responsibly and sustainably. The FSC vets forest managers and lumber production companies to ensure that their methods are sustainable before going to market. Certification criteria require that logging methods preserve biodiversity, reduce environmental impacts, maintain the rights of indigenous communities and forestry workers, include a long-term forest management plan, comply with laws and international treaties, and that logging practices do not destroy forests, protect the habitats of endangered wildlife, and that profits from commercial forest endeavors are shared equitably with forest communities. The FSC is non-governmental, non-for-profit, and all lumber producers participate in the program voluntarily. Green Depot carries FSC-Certified wood, and can provide Chain of Custody (CoC) documentation, ensuring total tracking of the supply chain from forest to mill to processor, distributor, or treater; and finally, to delivery at our warehouses or jobsite. In particular, check out one of the HFHC products we carry: Butcher Block Countertops, or Madrona flooring!